A group of astronomers are meeting this week to plan out an ambitious and unprecedented project — capturing the first-ever image of a black hole. The researchers want to create an Earth-size virtual instrument called the Event Horizon Telescope, a worldwide network of radio telescopes powerful enough to snap a picture of the supermassive black hole at the heart of our Milky Way galaxy. "Nobody has ever taken a picture of a black hole," Dimitrios Psaltis, of the University of Arizona's Steward Observatory, said in a statement. Psaltis is a co-organizer of the conference, which began today (Jan. 18) in Tucson, Ariz. "We are going to do just that." Black holes are exotic structures whose gravitational fields are so powerful that they trap everything, even light. They were first postulated by Albert Einstein's theory of general relativity. However, scientists have yet to image a black hole. Researchers working on the Event Horizon Telescope — named after a black hole's "point of no return," beyond which nothing can escape — hope to change that. "Even five years ago, such a proposal would not have seemed credible," said Sheperd Doeleman of MIT, the project's principal investigator. "Now we have the technological means to take a stab at it." Doeleman and his team want to create a network of up to 50 radio telescopes around the world, which will work in concert to get the job done. This artist's illustration depicts scientists' new understanding of the giant black hole at the core of galaxy M87. The bright radio 'core' of the jet base is located very close to the central black hole no larger than about 10 times the size of the event horizon. The team plans to point the Event Horizon Telescope at the supermassive black hole at the Milky Way's center, which is about 26,000 light-years away and is thought to hold as much mass as 4 million suns. That's pretty big, but picking the object out at such a great distance is equivalent to spotting a grapefruit on the surface of the moon, researchers said. "To see something that small and that far away, you need a very big telescope, and the biggest telescope you can make on Earth is to turn the whole planet into a telescope," said Dan Marrone of the Steward Observatory. Researchers hope to get a picture of the black hole's outline, or "shadow." "As dust and gas swirls around the black hole before it is drawn inside, a kind of cosmic traffic jam ensues," Doeleman said. "Swirling around the black hole like water circling the drain in a bathtub, the matter compresses and the resulting friction turns it into plasma heated to a billion degrees or more, causing it to 'glow' — and radiate energy that we can detect here on Earth." General relativity predicts that the black hole’s shadow should be a perfect circle. So the Event Horizon Telescope's observations could provide a test of Einstein's venerable theory, researchers said. 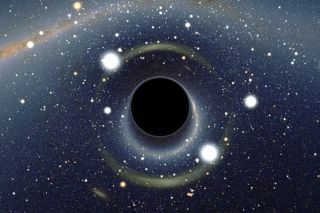 "If we find the black hole’s shadow to be oblate instead of circular, it means Einstein’s theory of general relativity must be flawed," Psaltis said. "But even if we find no deviation from general relativity, all these processes will help us understand the fundamental aspects of the theory much better." The team hopes to keep adding more instruments to the telescope over time, providing a sharper image of our galaxy's central black hole as the months and years go by. Each telescope in the network will record its observations onto hard drives, which will be physically shipped to a central processing center at MIT’s Haystack Observatory, researchers said. Radio rather than optical telescopes are the right tool for the job, they added, since radio waves can penetrate the murk of stars, dust and gas between Earth and the galactic center.